One of the most widely asked questions I get is how to get started with a blog. 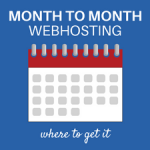 After many years of blogging, I’ve been with several different webhosts. 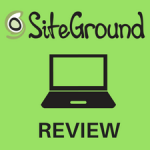 SiteGround is the best one I’ve found and that I trust. 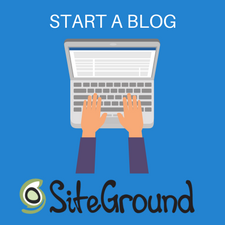 And today I’m going to walk you through a tutorial on how to start your blog with SiteGround web hosting. 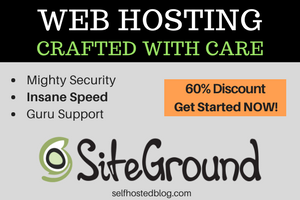 I’ll show you how to get 60% discount off your SiteGround hosting today. Why Start your Website with SiteGround Hosting? 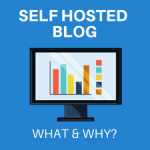 There are many reasons to start using SiteGround for your self hosted blog. I chose the top three reasons which were a priority for me when I was searching for the best web host for my WordPress blogs. 1. Your Blog Speed will be AMAZING! One of the worst things about my previous webhost was the slow speed. It was so ridiculously slow that I researched other web hosting providers with speed as my number one priority. 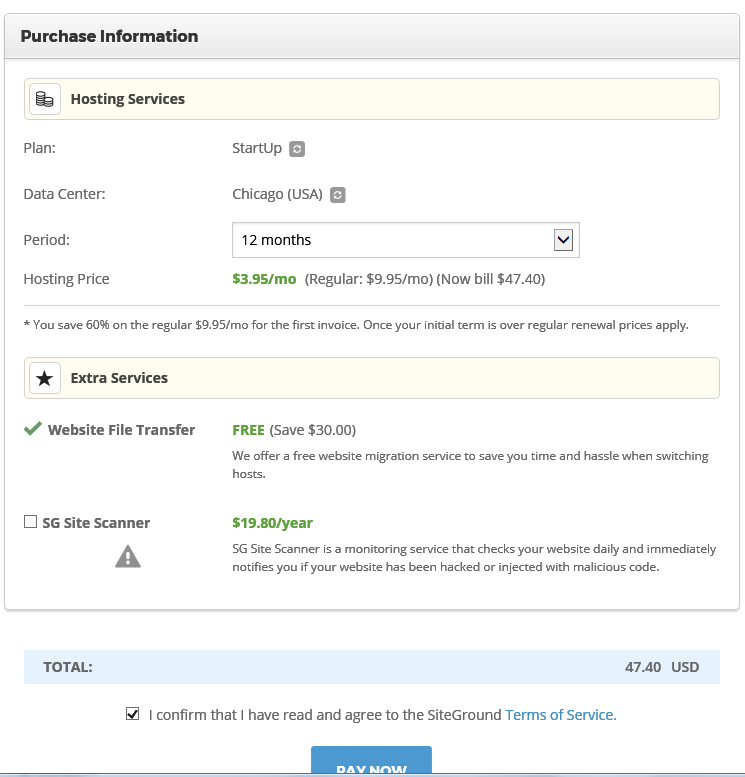 SiteGround web hosting was one of the fastest I found and I have to tell you, it’s pretty incredible. Check out my speed test. That’s FAST! 2. Their Uptime Is Incredible. Imagine how you would freak out if your blog went down? Yep, it’s happened to me one too many times with other hosting companies. Then here comes SiteGround with 99% uptime to keep your blog running and your nerves calm. The customer service I’ve received from SiteGround is pretty incredible. They respond immediately. Not only do they help solve the issue, but they go often go over and above by providing even more information. Now, I don’t know if you’ve ever sat on the phone listening to awful music while you wait to talk to a customer service rep, but that doesn’t happen with SiteGround excellent customer support. They are available 24/7 via phone, online chat or you can open a ticket. Have a domain name picked out ahead of time or already registered. It doesn’t matter where you register a domain name. I like Namecheap to find and register domain names only. Don’t worry, you can “point” your domain name to SiteGround after you get set up. Go to SiteGround and click Choose Plan. Startup. 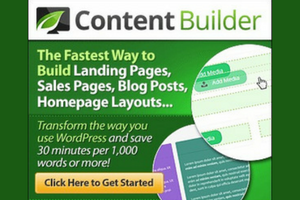 This is a GREAT deal if you are just getting started with blogging and have one website. You’ll get 60% off bringing your cost to just $3.95 per month. Think about it as an investment. GrowBig. 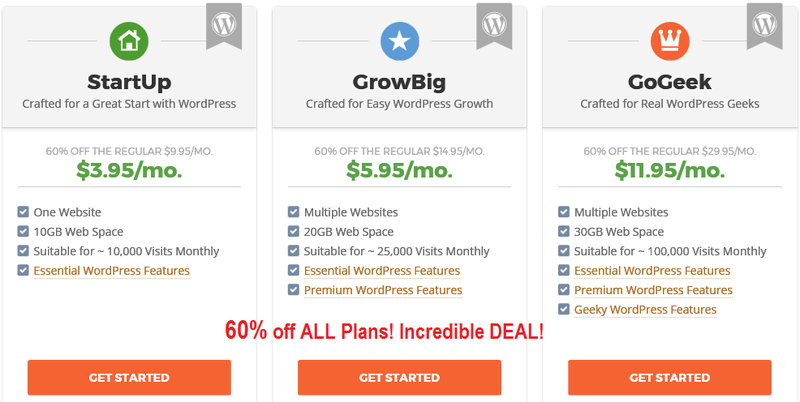 Another FABULOUS deal if you plan to have multiple websites. GoGeek. I went with the GoGeek plan. I have multiple websites and love the Geeky WordPress features. Choose your plan and click Get Started. Register a New Domain. It will cost an additional $14.95. I Already Have a Domain. 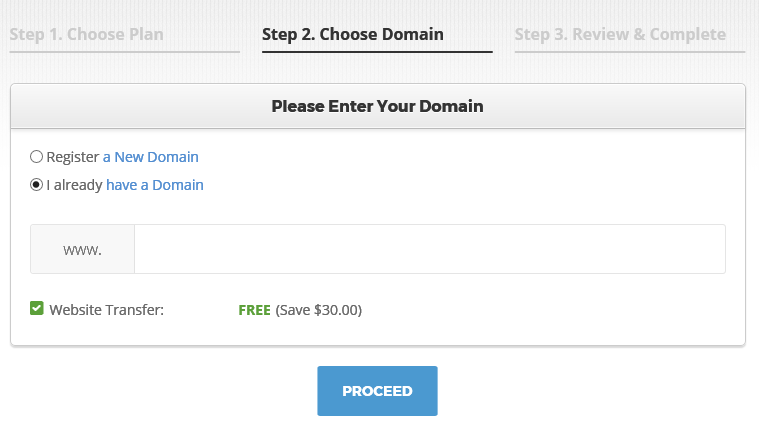 If you registered a domain elsewhere, choose this option. 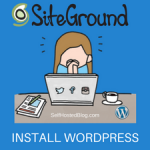 If you already have a blog setup up with another host, SiteGround will do the website transfer for you for free [save $30]. In Step 3, Review and Complete, fill in your Account Information, Client Information (that’s YOU) and Payment Information. Your plan will be displayed. If you want to change it, click the small grey square to the right and select a new plan from the list. The Data Center closest to you will be displayed. You shouldn’t have to change this. Choose your time frame. If you choose 3 years [BEST DEAL], you’ll get the 60% discount for 3 years. If you choose 1 year, your cost will go up to the full amount when it renews in your second year. Whichever you choose, the cost for today will display just below. If you selected WebSite Transfer, it will display here. If you registered a new domain, you will see a charge here. AND, you should select Privacy if you registered a new domain. You can deselect SG SiteScanner. Your cost due today will show at the bottom right. Agree to the terms of service and click Pay Now. You’ll receive an email with your log in information within just a few minutes. Look for that email. 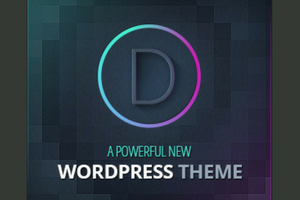 Your next step is to install WordPress in your website hosting account. Don’t worry, it’s super easy. You’ve read about how to start your website on SiteGround webhosting. Now it’s time to implement this tutorial and build your ROCK STAR blog. The first step? 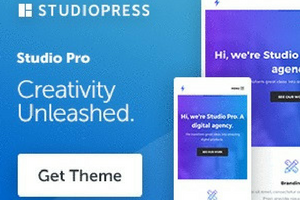 Visit SiteGround and get started. The next step? Leave a comment and tell me where I can find your AWESOME new blog! Awesome! You are welcome Rachel.